Our history books tell us that President Thomas Woodrow Wilson was the first progressive Democrat of the twentieth century and an exemplar for the future generations of liberal policy makers and Presidential administrations that would succeed him. He was the first President to have earned a PhD. A professor at Princeton University then its president, Wilson had a meteoritic rise to political power. After a mere two years as Governor of New Jersey, Wilson defeated both William Taft and Theodore Roosevelt in the presidential election of 1912. Wilson did away with a tariff system that favored the rich. He created the Federal Reserve that led banking reform enabling farmers in the West and the South to borrow on lines of credit. Wilson established antitrust laws, made it possible for workers to organize and participate in collective bargaining, advocated for an eight-hour work day (and forty-hour work week), and though reluctant at first, became an eventual supporter of women's’ suffrage and the 19th Amendment. Following the devastation of World War I, Wilson was instrumental in organizing the League of Nations, with the goal of cooperatively resolving international disputes and preventing wars. But resistance by a Republican controlled U.S. Senate, determination of European leaders to punish Germany, and the stroke he suffered in the last year-and-a-half of his presidency prevented ratification. While running for president in 1912, Woodrow Wilson addressed to a letter to a prominent black church official, writing: “Should I become President of the United States you may count upon me for absolute fair dealing for everything by which I could assist in advancing the interests of the race.” But once elected, he did the opposite. Born in Virginia in 1856, the son of a Confederate Army chaplain, Wilson had witnessed Robert E. Lee in the custody of Union soldiers after his surrender in Appomattox in 1865. Wilson, always a loyal Southerner, spent his formative years in Georgia and South and North Carolina. He never was able to transcend his antebellum upbringing. His administration endorsed the Racialist Movement of the teens, the popular form of eugenics that played a critical role in forming U.S. immigration policy and anti-miscegenation laws. Wilson’s policies either condoned or openly advocated Jim Crow laws, segregation, and racial supremacy. 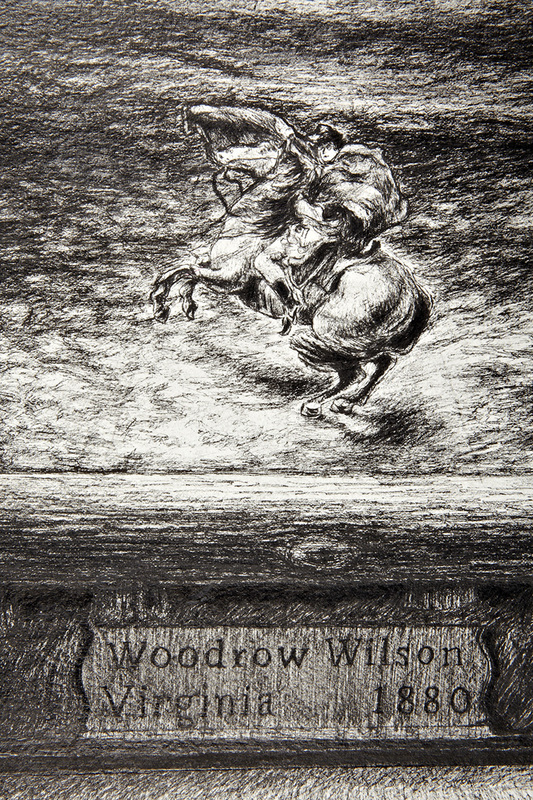 Three drawings in this body of work look critically at the Wilson legacy. In 1913, Washington was a fiercely segregated town but government offices were one of the few exceptions. They had been integrated during the period of post-war Radical Reconstruction as an effort to enable blacks to obtain federal jobs and to work with whites in various government agencies. Wilson quickly reversed these progressive policies and dismissed fifteen of the seventeen black supervisors replacing them with whites. Not only were cafeterias and restrooms segregated, but screens were set up in many federal offices to separate African-American workers from whites. Advancement, once possible under previous Republican administrations, was now virtually impossible. Birth of a Nation seemed to have fulfilled its purpose. Nothing was more effective than reinvigorating the then dormant Ku Klux Klan, which used the film as a recruiting tool to bring in millions of new members from both the South and the North. The NAACP fought back and made many unsuccessful attempts to remove the film from distribution and have it banned nationally, but the film remained extremely popular with white audiences. Wilson had a great admiration for the liberal statesmen of Victorian England, most notably William Gladstone and John Bright. 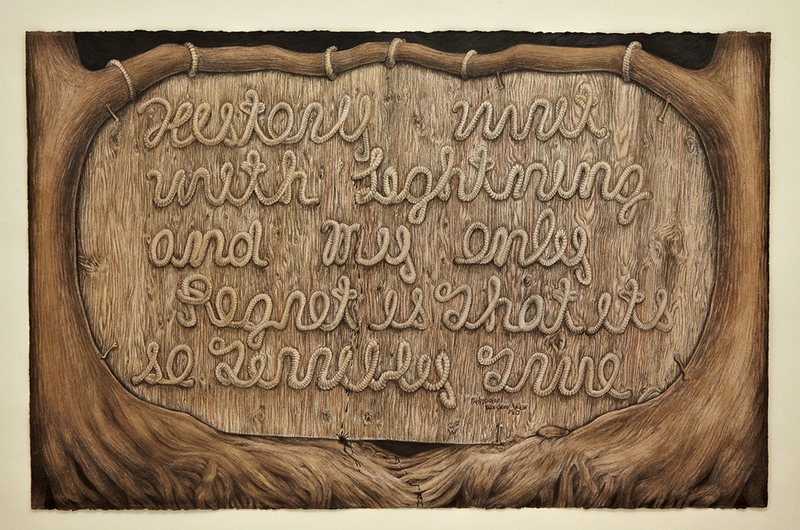 The context and meaning for Wilson’s confounding quote, “Because I love the South I rejoice in the failure of the Confederacy” is expressed again in cursive rope form, this time in front a diorama typically found in a natural history museum. The speech containing the above quote was given following Wilson’s first year as a law student at the University of Virginia in 1880. John Bright was an ardent supporter of the Union cause and rallied his fellow parliamentarians to prohibit the British Government from forming any alliance with or aiding the Confederacy in any form. Giving a paean to Bright to a white Southern audience just three years after the end of reconstruction was inviting both controversy and scorn. Wilson went on to explain that a rebel victory and the continuation of slavery would ultimately end in an economic and social disaster for the South. One wonders is this what Wilson really believed? The statement seems inconsistent with the character of Wilson. Ever a loyal son of the South, he would throughout his life express his Southern credentials. But Wilson was a very devout Presbyterian, and he had once considered becoming a minister. As a fervent and daily bible reader, he believed that God had ordained the extinction of slavery and the preservation of the Union so that American Democracy could shine as a beacon of hope for the rest of the world. Wilson’s beliefs were not exceptional. In fact, he merely echoed the generations of statesmen who had preceded him. Jefferson, Clay and, of course, Lincoln worried that slavery tainted American Democracy. Jefferson was concerned for the souls of white men and fretted that slavery turned men into despots. Clay and Lincoln knew slavery to be inconsistent with democracy and the natural rights of man: That no man was entitled to deprive another man of the fruits of his own labor. Clay believed that ultimate extinction of slavery would eventually come, but that slavery should until then be contained, a view that Lincoln shared up until the 1860s. But Lincoln was ever evolving, though slowly, and in the last few years of his life would come to believe in gradual enfranchisement and eventual full rights and protections of citizenship for the former slaves. “Nobody need to explain anything about the South to me it is a part of the country I know.” The post bellum South that Wilson grew up in was a nation defeated. As an impressionable youth he had experienced the spoils of war from the point of view of the vanquished. Throughout his life he would continue to feel the sting of radical Reconstructionists intent on disenfranchising the leaders of the Confederacy. In 1913 Woodrow Wilson became the first Southern elected president since prior to the Civil War. During his inaugural, Washington was crowded with Confederate revelers. The Rebel yell and renditions of Dixie rang through the streets. Dormant symbols of the old Confederacy became popular once more. Today symbols matter as much as ever, especially in the wake of the racially motivated massacre on June 17, 2015. In the midst of a Wednesday evening Bible study, a racial supremacist named Dylann Roof who had surrounded himself with emblems of the Confederacy tried to ignite a race war in the sanctuary of the Emanuel African Methodist Episcopal Church. Because of his heinous and violent act of gunning down nine blacks, the Confederate flag above the capital in Columbia has been taken down, and the debate about the meaning of that battle flag has a new urgency. Denial is the rampart to which hypocrisy clings. The defenders of the symbols of the Confederacy are oft to claim it’s about “heritage, not hate.” But to honor one's heritage does not give one license to expunge the truth. 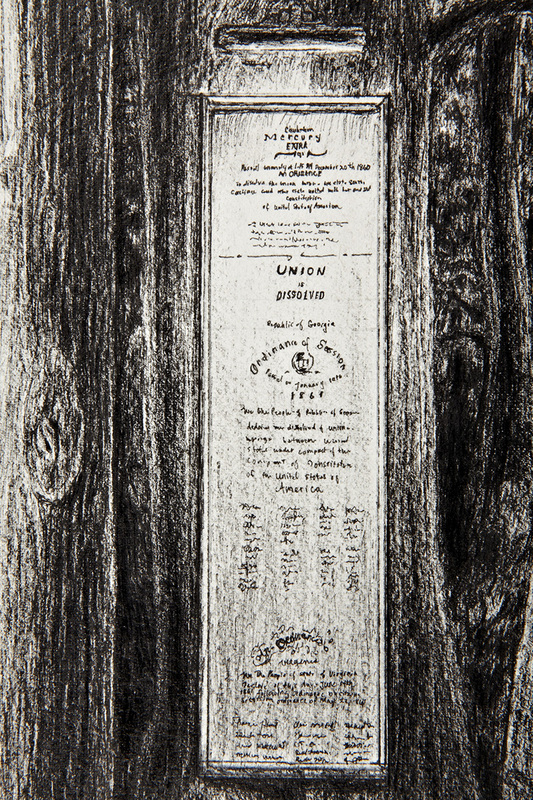 During their Secession Convention following the election of Abraham Lincoln in 1860, members of the South Carolina delegation made it very clear that their reason for fighting was the right to continue to own human beings. The Pulitzer Prize winning author A. Scott Berg wrote a biography of Wilson in 2013. Shortly after the book's release he gave radio interview in which he explained Wilson legacy, as he saw it. “Wilson believed in leveling the playing field. He believed this when he was fighting the club system at Princeton. But he was also fighting it through his administration; he was a man who felt that every American should have an equal shot at opportunity.” If that is so, then Wilson must have imagined African-Americans as something less than American. A complete reckoning must require truthful accounting. By that accord, Wilson’s legacy of liberalism shall be forever tarnished by hate and bigotry—not liberal values at all.